A few months ago I had an opportunity to visit Jana Natya Manch's (Janam) new home in Shadipur, Delhi. I had been curious to see the place and was aware of the organisation's endeavours to raise funds that would give it a home as well as a space in which the larger theatre community could also participate. A long conversation with Sudhanva Deshpande, leading member of Janam and Editor of Leftword publications ensued that afternoon. I had arrived at the place by Metro and found it to be conveniently located, not too far from the station. Geographically, Shadipur is located in West Delhi, and the Metro connection on the Blue Line makes it also accessible for people coming from Gurgaon. 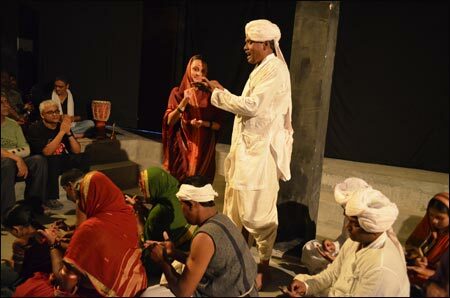 But above all, Janam's new home in a quintessential Delhi neighbourhood offers a model to theatre groups aspiring to have their own theatre space. Deepa Punjani (DP): I am pretty impressed with the space that Janam has created for itself. It's been a journey for you and your team. Can you share some special memories that made this possible? Sudhanva Deshpande (SD): I think what makes this really special is that literally hundreds of people from across the country contributed towards making this happen. We received more than 500 donations -- some of these are from organisations, like trade unions, where one donation actually includes contributions from hundreds of workers -- and there were hundreds of others who helped out in kind -- with material, expertise, time, contacts, advice, etc. 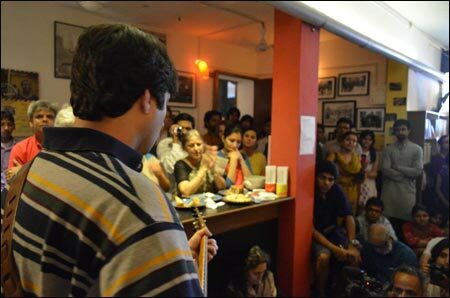 Especially inspiring and thrilling was the 8-day fundraising festival we held at Prithvi in December 2010, called 'Sarkash'. A number of artists contributed their performances towards the fundraising effort; Shabana Azmi, Naseeruddin Shah, Rajat Kapoor, Atul Kumar, Sunil Shanbag, Subha Mudgal are some of them. We had an exhibition and sale of old Janam photographs but what was most exciting was the number of spectators who were interested in what we were doing, and wanting to know how they could help. And of course, both Sanjna and Sameera, who were with Prithvi then. They backed us to the hilt, helping in a million ways. The other memorable occasion was very early in the fundraising efforts, when we had no clear idea what we were going to do or how. We met the senior trade unionist Com. M.K. Pandhe of the CITU and shared with him our dream. Com. Pandhe was a remarkable man of great foresight and wisdom. He was thrilled with our idea, and immediately extended an invitation to us to perform at the national conference of the CITU that was coming up. At the conference, before we performed, he got on to the mic, made a short but insightful speech about the role of culture in the workers' struggle, recalled the killing of Safdar, and asked the delegates to not only contribute from their own pockets at the end of the performance, but also to invite us for their various union functions across the country. As we moved into the audience after the show to collect donations, the response was overwhelming -- remember these are trade unionists, not rich folk, so a collection of something like Rs 50,000 was phenomenal. Many invitations also followed. As I said, we had at that point no plan on how to raise the money, no roadmap, but that single performance made us feel we could do it. DP: The best thing for me about the new space you have built for yourselves is that it is very rooted in the Shadipur neighbourhood that it is a part of. It's a model in that sense of how theatre spaces can be envisaged in our country. Did you always want something like this? SD: As you know, we are a theatre group that does mainly (though not exclusively) street theatre. 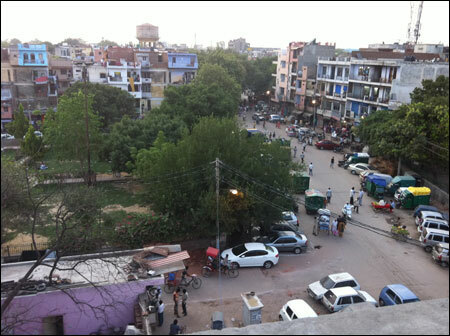 The street and its bustle, the mohalla and its chaos, give us life and tremendous energy. We love it. There was no question of going to any place that might be even a little bit 'elite'. We were also always clear that wherever we settle, that neighbourhood has to become our home, and we have to blend in. We cannot, should not, be seen as some fancy outsiders. Our work has to become part of the rhythm of the mohalla. The other residents have to feel we are one of them; that the space itself belongs to them. There has to be joint ownership. So every time we programme anything here, we are very mindful of how we can draw our most immediate audience into the performance. This doesn't mean that one caters to a notion of 'popular taste'. On the contrary, it means that we have to find innovative and interesting ways to reach out, and to enable this audience to start appreciating what the theatre piece is trying to do. I personally think this is the future of theatre spaces in a country like ours -- small, low tech spaces, not so expensive to maintain, nestled in relatively small neighbourhoods, primarily reaching out to no more than a 5-7 km radius. If we had more such spaces, theatre in our cities would start thriving in very exciting ways, but which we can't fully anticipate. For example, Berlin, which has a population of about 35 lakhs, has more than 80 active theatre houses. Delhi, with 4.5 times more people, has at the most 10! Is it any wonder that theatre in Berlin displays such enormous variety and range? SD: We decided to pool our resources when buying the space -- Janam, LeftWord, All India Democratic Women's Association, and also the School Teachers' Federation of India. All these are kindred organisations, and we've known each other for years. Coming together allowed us to bargain better, and of course having each other as neighbours helps in a million small ways. We never feel isolated and alone. Having a bookstore, cafe and theatre space under one roof is great for all these other organisations as well. As for the cycle service to deliver books, yes, I'm working on that. Inshaallah, it will become a reality! DP: You have another interesting idea about using cycles to generate electricity during shows, and you have taken to a lot of cycling yourself, haven't you? SD: Me and my crazy ideas! Heh. Yeah, I've taken to cycling. Not so much recreationally (I wish there were more time for recreation! ), but literally just to get from one place to another. I find that after you invest a bit of initial time figuring out how to manage traffic and all its hazards, actually the bicycle is the fastest form of transport, given average traffic conditions in the city. So it is actually highly practical. That it is also healthy and ecologically more responsible is only a bonus. About generating electricity through bikes, well, I saw some videos of rock concerts in California doing this and thought, well, why not here. But one has to figure out the design and engineering aspects of this. I'm hoping I can interest some people with technical expertise in this crazy endeavour. DP: You recently staged an exhibition about Shadipur and its people. Were the locals involved in it? Did they come in large numbers to see it? 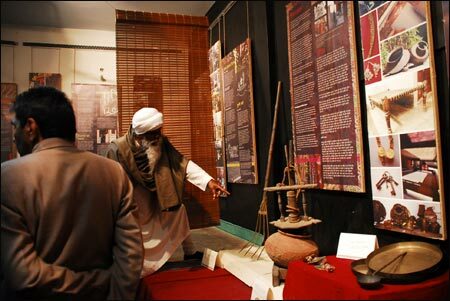 SD: We turned Studio Safdar into a museum of local history for two months. This was preceded by about 3 months of work on collecting stories, taking photographs, asking local residents to lend us artefacts from their homes, etc. The project was in association with the Centre for Community Knowledge of the Ambedkar University, Delhi (AUD). It was an outcome of a series of conversations that we've had with Surajit Sarkar over the years. Surajit, who is currently a consultant at AUD, has worked with video and appropriate technology both in the theatre (he's worked on several shows with Maya Rao), as well as in local communities in Pipariya, Madhya Pradesh. Surajit and Janam have worked together on several occasions in the past, and we've both been fascinated by oral narratives, people's memories, and local histories. The designer, Prachi Mittal, also came in with her inputs. A large number of local residents were interviewed. And when the museum opened, it was a scene to behold. Such excitement! A large number of people came, especially from the neighbourhood, and they kept coming. We had to extend the closing date twice. What was particularly satisfying was that many local schools sent their children. DP: The performance pit has to accomodate the two pillars that are part of the building's structure. Does that create any problems? SD: Well, not really. Ideally, of course, we'd have loved not to have them, but we haven't built the building, so we had to retro-fit a studio theatre in it. The floor was level when we got it, and we had the pit dug out to get more vertical space. The more imaginative performers will, I am sure, think of ways to use the pillars creatively. For instance, when Atul Kumar saw them, he was thrilled, and was already thinking of how he could incorporate them in his PIYA BEHRUPIYA (which he's promised to perform at Studio Safdar the next time they are invited to Delhi). For our own play CHAR RANG, I used the pillars -- and in fact the entire space -- quite unconventionally, so that the performance was angled diagonally across the space, including the pillars. Ved Segan, the architect who designed Prithvi, says that there is a way we could get rid of the pillars, but (a) that'll cost a bit of money, which we don't have, and (b) we are already quite fond of the pillars, so I'm not sure we'd want to get rid of them in the first place! DP: Have other theatre groups started using the space? Do you rent out to groups for rehearsals? SD: The space is primarily meant for other groups. Our own rehearsals do not take place in Studio Safdar. We rehearse on the terrace of the building -- better for street theatre to rehearse in the open. 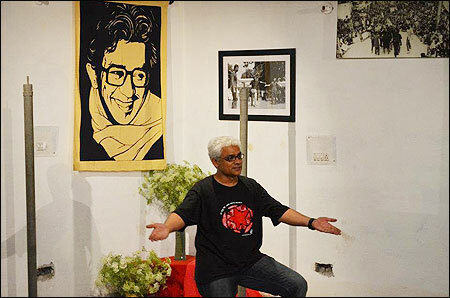 Studio Safdar has been created as a resource for the theatre community. Many groups have used it so far. Mainly it has been used for performance (preceded by a day of rehearsal in some cases), which is great, but what we really want it to be used for is a what I call 'advanced technical rehearsals'. Let me explain. For most theatre groups, a rehearsal space means any space we are not heckled out of -- a friend's drawing room, a classroom after school hours, a park, a terrace, whatever. Very few groups are able to rent rehearsal space. And our own expectations of rehearsal spaces is also minimal -- some privacy, a toilet and electricity is the height of luxury for us! So groups rehearse in any old space, and then end up taking the play straight to an auditorium. This can be an unsettling move for everybody -- actors, the directors, not to speak of the poor lights person who gets one morning at best to work out what they want to do. So what we are saying is this -- do your preliminary rehearsals in your regular space, and then come to Studio Safdar for the last week or ten days of rehearsals. Here, you will get a simple lights grid, home-made dimmers, projection facilities, sound facilities, and the chance to put up your set and figure out how your play will look once it goes into the auditorium. You can even do a couple of previews here if you want. If theatre groups start doing this, we are absolutely confident that the quality of what we see on stage will improve significantly. As for the economics of it, of course the group has to pay something, since the space itself is entirely non-funded and we need to keep it running. But if you tell us what you are doing and what the economic condition of your production is, we can work out something that does not hurt either of us. In any case, whatever little money the space earns, after paying bills and maintenance costs, is ploughed back into the space in terms of more facilities. Eventually, we have to get to the point where the groups that use the space regularly see it as their space, and have a vested interest in keeping it alive -- and thriving! DP: A lot of work that Janam does is outside the theatre so to speak. But do you feel that with this space and the neighbourhood it is in, you can encourage differents sets of people to visit you for performances? SD: Well, honestly, we have never had a dearth of audiences! That is the beauty of doing street theatre in a country as populous -- and warm -- as India. The neighbourhood we are in is not particularly 'evolved' culturally, in the sense that people are not in the habit of going to performances or art galleries or whatever. But that has its own advantages -- the audience is more 'spontaneous', more open to learning, and more appreciative of the fact that someone is making the effort to give them something. That is touching and humbling. What we are determined to do is not to turn Studio Safdar into an 'elite' space. The space belongs as much to a cycle rickshaw puller as to the owner of a haveli in Shadipur. DP: Which has been Janam's most recent production? SD: We recently worked with Anurupa Roy on a show called The Great Indian Circus. The show uses the circus form to talk of issues around hunger and food in India. Anurupa's work is exciting and we learned a lot while working with her. Of course, the challenge was to do a circus in which none of the performers can do a single trick (like juggling or rope-walking); we aren't trained in clownery, nor can we play any musical instruments with any great skill. Just thinking through the circus format, then, was hugely challenging and exciting. The show's been performed a few times, and I think it is improving with each outing. DP: Your group is considered to be one of the most significant and important groups when it comes to street theatre in India. There's also Safdar Hashmi's legacy. But how would you contextualixe your work in the scenario today in spite of the proverb that holds especially true for India that the more things change, the more they stay the same. SD: It is true that the Congress today is at its most discredited, what with so many scams, unemployment, price rise, etc., and the BJP is hoping to ride to power on Modi's alleged charisma, while being itself mired in corruption and offering no real alternative to the poor. So the outlook can appear bleak, I agree. But honestly, I am not without hope. Recently, all the central trade unions got together to organise a two-day strike. What was amazing was that even trade union wings of the Congress and the BJP were part of this action. This shows that there is real pressure on them from below. For instance, there are massive movements against the mining corporations in places like Odisha. Movements against forced land acquisitions have taken place all over the country. In fact, opposition to neoliberal policies and austerity measures are growing through the world -- whether it is in the Middle East, or Latin America, or continental Europe, or North America, or even in China and Russia. All these regions and countries have been rocked by massive unrest and demonstrations. All these are, in one way or another, revolts of the poor against conditions that push them ever deeper into poverty. I think things are stirring below the surface in India too, and therefore this is an interesting and challenging time to be performing on the streets. DP: There is the nice, smallish cafe you have created and Romila Thapar the historian gave you a compliment saying that it reminded her of small cafes in East Europe. When do you graduate to a professional coffee machine that will deliver the perfect espresso? SD: Arrey -- you said it! I do in fact have an excellent espresso machine, but it needs some minor repairs and I am unable to find the right mechanic for it in Delhi. In any case, everything in the cafe is donated by friends -- all our crockery, our microwave, refrigerator, and even our furniture. So I'm hoping that some good Samaritan will come by and want to donate us an espresso machine. The current one, which needs repairs, is donated by Mukul Mangalik, who teaches history in Delhi University and is without doubt the best barista in town. He once taught me history in college, and then, all these years later, he's taught me how to run a cafe. So if there is anyone who wants to support a small, left-wing cafe in Delhi, they know May Day in open and willing to accept donations!